Pour the milk into a deep plate or a glass. Add the chia seeds and stir properly for a minute to remove all the lumps. Let the chia seeds soak and gel for about 10 minutes. Stir once or twice during the gelling process. Start with the yogurt and put it into a blender jar. Roughly chop the banana and the pear and put them into the blender. Process until nice and smooth. 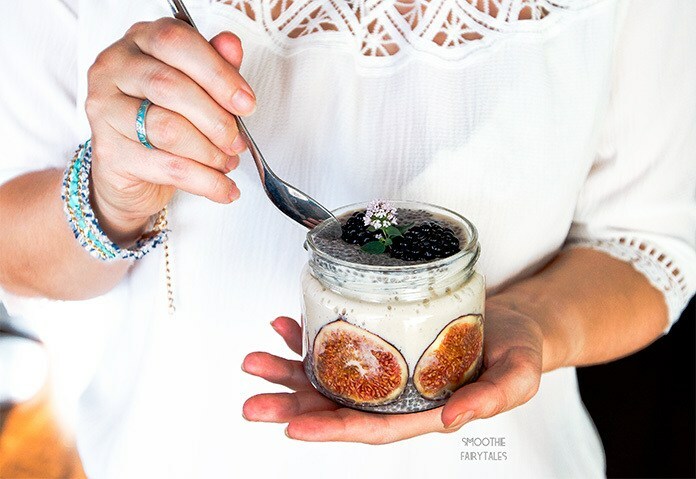 Put a layer of chia pudding into a serving glass or jar. Cut the figs, or other fruit of your choice, very finely and stick them to the sides of the jar. Remember that the finer you cut your fruit, the easier it sticks to the jar. Then, pour carefully the banana and pear smoothie on the chia seeds while leaving some space for another layer of chia seed pudding. Put the remaining chia seed pudding on top of the smoothie layer. Lastly, top your beautiful chia pudding with some fresh berries, fruits or nuts. Place the jar in the fridge for some hours or, even better, overnight. You can keep chia pudding in the fridge for up to two days.